In the dinner party of Bollywood star Shahrukh Khan, tennis star Sania Mirza also participated and she also took selfies during the occasion. After winning Italian Open along with Swiss partner Martina Hingis, Sania Mirza has just arrived India. 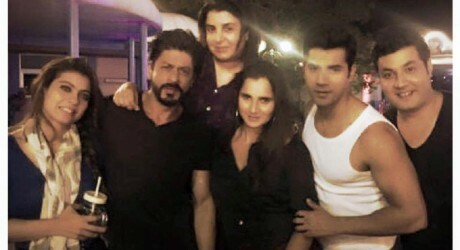 Recently, Shahrukh gave a dinner party in honor of Apple’s Chief Executive Tim Cook in which Sania also participated. Sh etook selfies with honorable guest and the host. On her Twitter account, she shared pictures of other Bollywood stars also including Farah Khan, Amitabh Bachchan and Aishwarya Rai Bachchan.